National-Socialist Worldview: Followers of Dinesh D'Souza are Stupid. Followers of Dinesh D'Souza are Stupid. What follows is an obviously satirical song that has Democrats boasting of their racism and various unpleasantries that Cultural Marxist (Jewish) propaganda emphatically associates with racism. It includes the line, "Stick with us and we'll create an Aryan nation." In other words, it is a song that echoes D'Souza's own bizarre characterization of the Democratic Party, in his books Hillary's America and The Big Lie. That already should be enough for somebody with an ounce of common sense to conclude that the song wasn't really made by Democrats. But there's more: one of the vocalists uses a funny voice. You have to be more than just poorly informed. You have to be very dim to think that this is real. It was so bad that a Jew, Rubin Friedman, felt obliged to explain to D'Souza's gullible goy followers that it was a joke. I guess that I should not be surprised. If they could accept the rubbish that he has peddled in his books, then they are ready to believe anything. It is really too bad that the eugenic sterilization movement initiated by Republicans more than a century ago did not make greater progress in raising the national IQ. 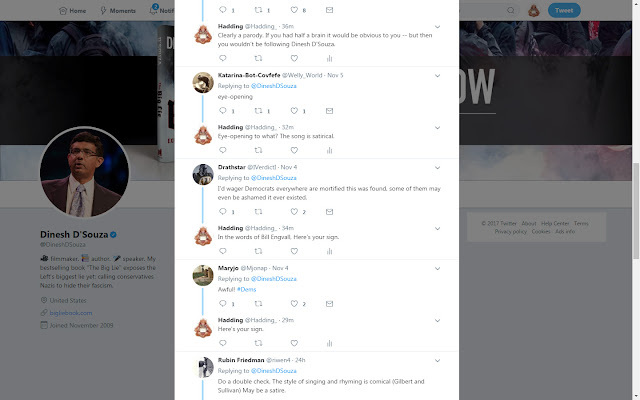 UPDATE (11PM EST): D'Souza apparently recognized today that his followers cannot tell whether he is serious or joking, and now tells them up front when he is joking.